Analysis: Although he was the Bears' primary receiving weapon out of the backfield this year, his usage was erratic on a week-to-week basis, making him a volatile fantasy option. Signed through 2020, he'll likely continue to see his role grow in the offense, giving him the potential to see a leap in his fantasy production. 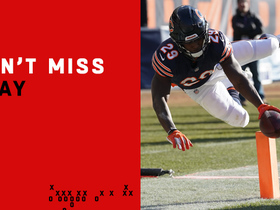 Analysis: Cohen was clearly not a part of the game plan, as he was targeted just a single time while being used as nothing more than a change of pace in the running game to Jordan Howard. He's now been held to fewer than 60 total yards in six of his last eight games, and he'll finish the regular season with a tough matchup at Minnesota. Analysis: Cohen failed to repeat last week's triple-threat performance, but he still turned in a fine fantasy outing for a backup running back. The 69 rushing yards actually marked a season high for the 23-year-old, but fantasy owners roster Cohen for his pass-catching abilities in PPR formats, so any rushing yards are usually a bonus. He will look to do more in the receiving department (the 20 yards marked his lowest total since Week 9) against the Packers next Sunday. 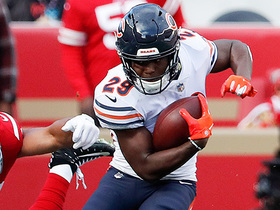 Cohen rushed three times for 14 yards and brought in seven of eight targets for 45 yards and a touchdown in the Bears' 23-16 win over the Lions on Thursday. He also returned four punts for 46 yards. Analysis: As customary, Cohen played a minimal role on the ground but provided solid production through the air. The dynamic second-year back's 14-yard touchdown reception with 13:40 remaining erased a 13-9 deficit at the time and served as fourth receiving score of the campaign. Cohen now has an impressive 16 catches over his last three games combined and will look to continue his strong stretch of play in a Week 13 battle against the vulnerable Giants defense on Dec. 2. Cohen ran the ball seven times for 27 yards and caught three of four targets for 23 receiving yards in Sunday's 25-20 win over the Vikings. 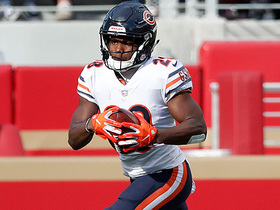 Cohen rushed seven times for 15 yards and a touchdown and brought in six of seven targets for 29 yards in the Bears' 34-22 win over the Lions on Sunday. Analysis: Cohen was able to find his way into the end zone on the ground for the first time since Week 6, scoring on a three-yard run in the first quarter to open the scoring. The change-of-pace back's reception totals were also encouragingly back up after a pair of atypical one-catch efforts, reestablishing his high-volume role in the air attack. 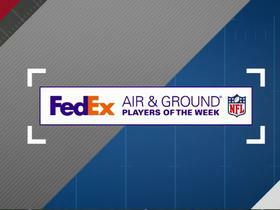 Cohen will look to build on Sunday's performance versus the Vikings in Week 11. 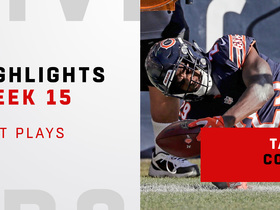 Cohen rushed six times for five yards while adding one reception for an additional eight yards in Chicago's Week 9 victory over the Bills. Analysis: With Chicago controlling this game from wire to wire, Jordan Howard took on the lead role of the backfield as Cohen was mostly invisible. Although he's had double-digit touches in three games this season, this is the fifth time he touched the ball eight times or fewer. He'll certainly continue to have a fantastic ceiling, but this game should remind fantasy managers that he has a dangerously low floor as well. Cohen rushed five times for 40 yards and caught one of three targets for a 70-yard touchdown in Sunday's 24-10 win over the Jets. Analysis: Cohen was extremely effective on a per-touch basis, delivering a strong performance despite getting the ball only six times. He found the end zone for the fourth straight game by taking a first-quarter screen 70 yards to the house against an all-out blitz. Cohen almost made a blunder in the return game by inexplicably touching a bouncing punt, but he was able to dive back on top of the ball. He'll stay firmly in the mix in Week 9 against Buffalo. Cohen rushed six times for 14 yards while adding eight receptions for 69 yards and a touchdown in the Bears' Week 7 loss to New England. Analysis: Cohen led the Bears with 12 targets, but the New England defense was prepared for him, and they significantly limited his ability to gain big yardage after the catch. However, he saw enough volume to emerge with a productive afternoon. He's now posted at least 83 combined yards and a touchdown in three straight contests, and he's settling in as a solid weekly starter for fantasy managers. Cohen rushed five times for 31 yards and a touchdown while adding seven catches for 90 yards in Chicago's overtime loss to the Dolphins. Analysis: Early in the game, it appeared that Cohen might not get as much work as he did in his Week 4 explosion, but once the game turned into a bit of a shootout, he emerged as an integral part of the offense, especially in the passing game. Although his usage may be game specific, his big-play ability gives him excellent weekly upside, but his inconsistent weekly usage also presents a concerning floor. 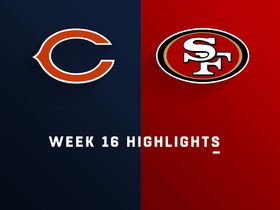 Cohen rushed 13 times for 53 yards and brought in seven of eight targets for 121 yards and a touchdown in the Bears' 48-10 win over the Buccaneers on Sunday. He also returned three punts for 14 yards. Cohen rushed five times for 53 yards while catching three passes for an additional 15 yards in Sunday's victory over the Cardinals. Analysis: Cohen's 68 total yards was two more than he had compiled in the first two games combined, and he's yet to have touched the football more than eight times in any contest. His lack of consistent usage has relegated him to being a low-upside fantasy option unless the coaching staff chooses to increase his involvement in the game plan. Cohen (ankle) wasn't listed on Wednesday's injury report, Kevin Fishbain of The Athletic reports. Analysis: Cohen was removed late in the fourth quarter of Monday's win over the Seahawks and later diagnosed with an ankle injury. In the locker room afterwards, he was in good spirits, head coach Matt Nagy told Adam Hoge of WGN Radio 720 AM Chicago. With a full practice under his belt Wednesday, Cohen will focus on getting on the same page as quarterback Mitchell Trubisky, who has targeted the pass-catching back on just five of his 69 throws this season. Cohen (ankle) appears to be fine after exiting late in the fourth quarter Monday of the Bears' 24-17 victory over the Seahawks, Adam Hoge of WGN Radio 720 AM Chicago reports. Analysis: Head coach Matt Nagy said Cohen was dancing around in the locker room after the victory, which offers as good of evidence as any that his ankle issue isn't a concern. Prior to departing, Cohen contributed eight yards on four carries and caught one pass for 17 yards. Cohen is questionable to return to Monday's game against the Seahawks due to an ankle injury. Analysis: Cohen carried four times for eight yards and caught one pass for 17 yards prior to exiting. He also returned four punts for an average of 14.5 yards per tote. 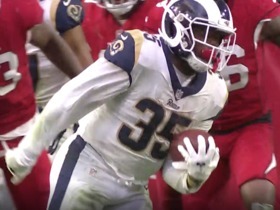 The severity of Cohen's injury is not yet known, but Benny Cunningham figures to see an extended role in the Bears' backfield as long as the second-year running back is out with Bryce Callahan in line to see punt return opportunities. Cohen rushed five times for 25 yards while catching three passes for 16 yards in Sunday's loss to the Packers. Analysis: Cohen was used often while the Bears were pulling out to a 17-0 halftime lead, but his role decreased as the team played more conservatively the rest of the way. He wasn't used as solely a change-of-pace option to Jordan Howard, and both backs were often on the field at the same time. In addition, Cohen was used as a quarterback when the team used the wildcat formation. This will likely be one of his least productive games, as it's clear the coaching staff plans to use him in a variety of ways. Cohen won't play in Thursday's preseason contest against the Bills, Kevin Fishbain of The Athletic Chicago reports. Analysis: Cohen exits exhibition season with just one touch, a 10-yard catch in preseason Week 2. As he prepares for his second campaign, he's set to serve as the pass-catching back after a 53-reception season as a rookie. That said, starting running back Jordan Howard is expected to have a third-down role as well, which could place a damper on Cohen's potential. Cohen will not play in Saturday's preseason game against the Chiefs, Kevin Fishbain of The Athletic Chicago reports. Analysis: The shifty second-year tailback is among 31 Bears who will remain on the sidelines for Saturday's matchup, leaving Benny Cunningham, Taquan Mizzell, Ryan Nall and Knile Davis to shoulder the load out of the backfield for the Bears on Saturday. Cohen could return to action during the preseason finale, or the staff could elect to save him and the rest of the regulars for Week 1. Bears coach Matt Nagy plans to move Cohen around the formation to take advantage of his speed, Patrick Finley of the Chicago Sun-Times reports. Cohen said he added muscle in the offseason and is up to 190 pounds, Brad Biggs of the Chicago Tribune reports. Cohen will see a bunch of touches in 2018 although Jordan Howard will work as the featured back, Patrick Finley of the Chicago Sun-Times reports. Cohen rushed three times for 13 yards while adding 14 yards on six receptions in the Bears' Week 17 loss to the Vikings, ending the season with 370 rushing yards and two touchdowns along with 353 receiving yards with another touchdown. Cohen rushed twice for one yard while hauling in four passes for 16 yards in a Week 15 loss to the Lions. Cohen rushed 12 times for 80 yards and caught both of his targets for five yards during Sunday's 33-7 win over Cincinnati. Cohen caught four passes for 39 yards while adding five yards on two carries along with a touchdown on a punt return Sunday against the 49ers. Analysis: Cohen appeared to make a bad decision when running backwards after fielding a punt, but once he changed direction, he found a seam and showed off his blazing speed as he ran untouched for the score. Otherwise, he caught each of his four targets and continues to be terribly underused in the Bears offense. With just 31 touches over his last five games, his lack of volume makes him a risky fantasy option. Cohen caught two passes for eight yards while losing 11 yards on two carries in Sunday's loss to the Eagles. Analysis: After posting one of his best efforts of the season Week 11, Cohen was an afterthought in the game plan in this contest. With five or fewer touches in four of the last five games, he's little more than a desperation option for fantasy managers. Cohen played 31 of 63 offensive snaps in Sunday's 27-24 loss to the Lions. Cohen had nine rushes for 44 yards and a touchdown while adding four receptions for an additional 15 yards in Sunday's 27-24 loss to the Lions. Analysis: After seeing less work than Bennie Cunningham last week, Cohen's nine rushing attempts were six fewer than lead back Jordan Howard. The rookie rewarded the team by gaining almost five yards per carry, but Cohen's workload going forward will be nearly impossible to predict based on his inconsistent usage through 10 games. He's worth holding onto in the event that he begins to see regular work. Cohen played only 13 snaps on offense in Sunday's 23-16 loss to the Packers, catching one pass for 10 yards and taking one carry for one yard. Cohen caught a pass for 10 yards while adding one rushing attempt for an additional yard in Sunday's loss to the Packers. Analysis: Cohen has become an afterthought in the team's game planning as he's carried the ball five times over his last three games while catching one pass in each of those contests. He'll be a big-play dependent dart throw as a fantasy option until he begins to see consistent usage. 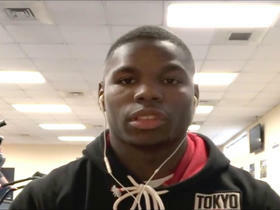 Chicago Bears running back Tarik Cohen joins "NFL Total Access" to talk about being named Black College Football Pro Player of the Year, his team's 2018 season and more. 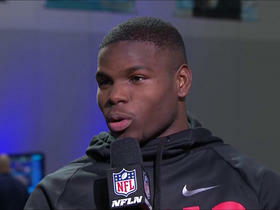 Chicago Bears running back Tarik Cohen joins "Super Bowl Live." Chicago Bears running back Tarik Cohen squeezes through a hole and gets into the end zone for a 3-yard touchdown. 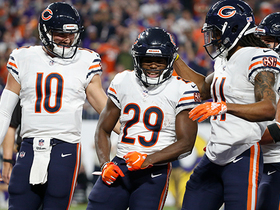 NFL Network's Kyle Brandt explains how Chicago Bears head coach Matt Nagy has made running back Tarik Cohen 'one of the most dynamic players in the league' in 2019. Chicago Bears running back Tarik Cohen shows shades of Barry Sanders on this ankle-breaking run. 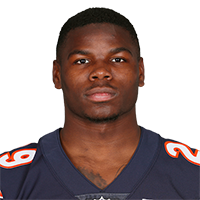 Chicago Bears running back Tarik Cohen catches a pass and runs it in for an impressive 12-yard touchdown. Watch the best plays from Chicago Bears running back Tarik Cohen Week 15 when he faced the Green Bay Packers.